October 20, 2015 – Scientists from the University of Colorado Boulder and University of Colorado Anschutz Medical Campus are stepping out of their offices and labs to share their work through hands-on activities Saturday, October 24, at the Boulder Public Library, 1001 Arapahoe Ave.
“Portal to the Public: Meet a CU Scientist” will be held from 1 to 3 p.m. and is free and open to all ages. Hosted by CU Science Discovery, Portal to the Public is a national network that connects the public with current science in their own communities through direct interactions with local science, technology, engineering and mathematics (STEM) researchers and experts. It’s Colorado’s first such event. Eleven CU scientists representing the latest research in biotechnology, cancer prevention, hydrology, microbiology, climate science and engineering have been training for two months to share their scientific expertise in the most impactful way for a lay audience. 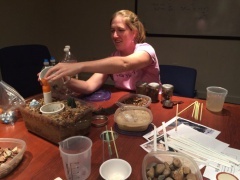 Science Discovery is CU-Boulder’s science education outreach program housed in the Division of Continuing Education. Founded in 1983 to heighten young students’ interest in science, CU Science Discovery coordinates an array of programs that connect K-12 students, teachers and more to current CU scientific research and expertise.